After many years of searching for home Bible study curriculum that both interested Amber and met our theological needs, we were selected last Fall to review an Old Testament lesson set from Grapevine Studies. It was a perfect match for us! Now this year we have been able to review their New Testament Overview Part 1 (Level 4), which is part of their Stick Figuring Through the Bible series. We received a downloaded copy of both the student Level 4 book and the teacher Level 3-4 book of the New Testament Overview Part 1. I often waffle back and forth on whether I prefer electronic books or hard copy books for our homeschool curriculum. In this case, the student book does need to be printed since it is a consumable workbook where the student does their stick figuring. In the end, I decided to print and bind Amber's student book while leaving my teacher book in electronic form on my iPad. The principle behind the Stick Figuring Through the Bible series is to allow the students to illustrate the Bible stories as they study in order to make the lessons as interactive as possible. The drawing along with the additional components of each lesson make this Bible curriculum perfect for all types of learners. Quite possibly the most important feature for our family is the method in which doctrine is handled in this curriculum. The teacher's guide states up front, through a statement of faith, the beliefs held by the publisher. Then teachers are encouraged to prayerfully decide how to apply the lessons. Specific doctrine is not included in any of the lessons, which makes the Grapevine Studies curriculum suitable for the majority of Christian religions since it is up to the parent / teacher to apply their own beliefs. The New Testament Overview Part 1 covers from the birth of John to Jesus' ministry in twelve lessons beginning with an initial timeline lesson that covers from Adam through Jesus' ministry. The full color teacher's guide includes stick figures to use for each part of the timeline, as well as a narrative for the teacher. The majority of the level 4 lessons begin with a Quest page that teaches the use of topical Bibles, Bible dictionaries, and concordances. There are also Quest Questions for the student to ponder. Grapevine Studies links on their website a recommended three book reference set to use with the level 4 studies, however we have managed to quite successfully complete the Quest pages using our study Bible and online resources. Still, if it's in your budget and you plan to complete several of the level 4 studies, I would recommend purchasing the reference set. The lessons then cover a particular event through passage reading and stick figuring with a set of lesson review questions to wrap it all up. Memory verses related to the topic are supplied at the end of the lesson. The teacher's guide provides a quick summary of the lesson goals and key points for the entire study prior to the details for each lesson. This is a great way to keep your mind focused on the study and not get lost in the details of drawing each lesson. The teacher's guide includes Bible passages to read and stick figure, with the recommended figure drawings provided. Answers to the review questions are shown for the teachers, but due to copyright limitations very few of the Quest page questions can have direct answers. 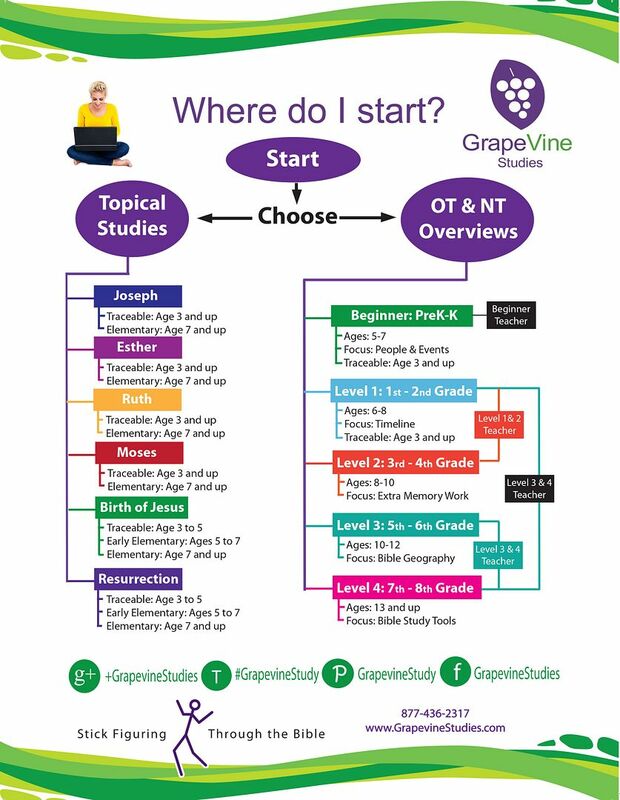 Find the Grapevine Studies Bible curriculum that works for you! Having previous experience with Grapevine Studies, Amber wanted to work on the initial timeline lesson on her own, so I handed over my iPad and let her read through the teacher's narrative and then add the figures to her timeline. After that lesson though we worked through each one together. Because of Amber's confirmation homework from our church, we chose to use these as twelve weekly lessons where we completed an entire numbered lesson in one session instead of 45 daily lessons. Both schedules are perfectly acceptable and easy to accomplish. My drawing ability is notoriously non-existent, even for stick figures, but this did not detract from our ability to enjoy the lessons. Instead of demonstrating each scene of the lesson for Amber, I went through the narrative after our Bible reading and then enlarged the iPad drawing for her to copy. Afterwards, we continued verbally through the review questions for the lesson. Giving us the means to easily add meaningful Bible study to our school days has allowed the New Testament Overview Part 1 from Grapevine Studies has become another Bible curriculum success for us. No matter how Amber was feeling, the mix of learning styles made it possible for her to understand and enjoy the lesson, while I appreciated the ability to add our own theology to each story studied. Visit other members of the Review Crew see how the various levels of Grapevine Studies worked for them! We are totally hooked on Grapevines. It was lots of fun. We sure love Grapevine! I love your idea of having them bound. We used 3 ring binders, but this would take up much less room! Thanks for the idea!